Cancun, Mexico (August 9th, 2010) – For the third year in a row, the Cancun Convention & Visitors Bureau will celebrate International Whale Shark Day on August 30th, with a deeper knowledge and appreciation for the importance and need of preserving the unique species. 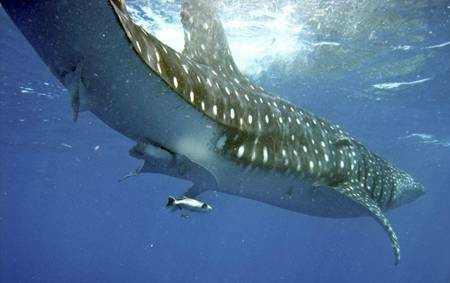 Back in 2008, during the International Whale Shark Conference that took place in Isla Holbox, representatives from over 40 countries formally established whale shark day to celebrate the world’s largest fish, known locally as the “Domino,” because of the white dots on their skin. On June 5, 2009, the Whale Shark Biosphere Reserve was established off the northern coast of Quintana Roo, which is where masses of the whale shark species migrate every year. During Whale Shark season 2010, the Natural Commission of Protected Natural Areas, (CONANP) has implemented and installed satellite transmitters on 15 different whale sharks as part of the Domino Research Project, with the hopes of aiding researchers in the further investigation and research of behavioral patterns of these animals, once they leave the shores of Quintana Roo. Investigation into the Atlantic Mexican whale shark commenced seven years ago, in 2003 with the Domino Project. As part of the project investigation a weekly flight, initiated in 2004, is utilized to create a whale sharks census during the season. Current facts of the investigation have provided to be of great importance such as finding uncharacteristically large quantity of fish eggs in the ocean during whale shark observation. This is one of the main reasons these enormous creatures continue to migrate to the area, making it a vital issue to protect the large quantity of fish egg species and respect the laws put in place to protect the gentle giants who visit our waters. Attracted by the huge abundance of plankton, this aggregation is believed to be the most important in the world based on the quantity of individuals, variety in sizes and large concentration of both male and females. As a touristic resource in Quintana Roo, the whale shark represents a world class example of a sustainable use of natural resources; this activity has brought important social and economic benefits to former fishermen of Holbox, Isla Mujeres and Chiquilá, who have transformed themselves into activists for preservation of the species. Swimming with whale sharks calls for an extremely strict protocol, in order to preserve the species and their habitat. Among these simple but useful rules, we find the following: no more than ten people per boat, only two people at a time can swim with a whale shark, along with a guide, lifejackets must be worn at all times, it is forbidden to touch them, large boats and yachts are prohibited, only small boats are allowed and there’s a limited amount of permissions for certified tour operators who are able to visit the area. For more information, visit the Cancun Convention and Visitors Bureau website at: www.cancun.travel.